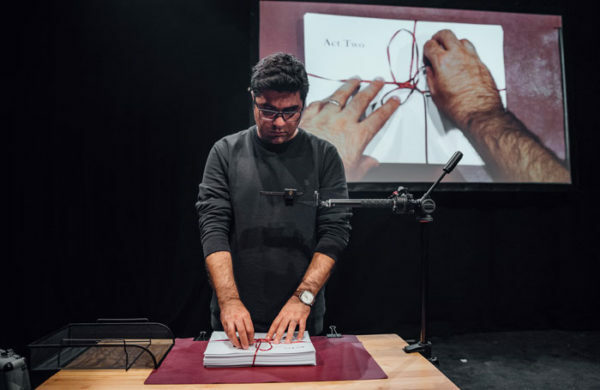 Translation and transcultural communication: Duška Radosavljević reviews the world premiere of a new work by Nassim Soleimanpour. Nassim means ‘breeze’ in Farsi. Though she named him this way, Nassim Soleimanpour’s mother did not expect that she would find it so hard to keep up with her son’s all-pervading international success. Those who have seen other works by Soleimanpour will be familiar with his life story – unable to get his work staged in his native Iran and prevented from travelling himself, the author created a piece intended to travel on his behalf. This was the international hit White Rabbit Red Rabbit which has been performed by, amongst others, John Hurt, Whoopi Goldberg and director Ken Loach. His plays, at least those known to us, are always self-referential and written to be performed on a one off basis by an actor who has never seen the script before the actual performance. In this respect they are constructed like a textual game, quite literally a series of instructions to be followed in the process of performance. Capitalising on the liveness of theatre, this creates a sort of immediacy for the audience which is exciting and dangerous – together with the actor, we are in the same boat, discovering the piece together and admiring the way in which the actor handles the unknown. Soleimanpour, in turn, does not always spare us from playful participation either. While seemingly prompted by a political impetus, Soleimanpour’s work is often humorous and even cheeky. In this particular instance, the playwright charms us into donating gifts to him and, if not careful, the performer might find themselves taking us all out for a meal afterwards. This is not altogether unjustified however, as it forms part of Soleimanpour’s larger project on this occasion – to bring us all closer to Iranian culture, with hospitality and generosity forming a crucial element of it. Without giving too much away, I’ll just say that translation and transcultural communication is a major theme of this piece. On the pretext that this work is also a part of Soleimanpour’s process of learning English, we get to learn some memorable words and expressions in Farsi thus putting us all on an equal footing, author included. Soleimanpour no longer lives in Iran and is now free to travel, which makes it possible, for the first time, for him to take part live in his own works. He is still going with the original concept of a live first performance of script but his presence now makes it possible for him to engage in some live writing too; an act that has an interesting effect both form- and content-wise. And there are two other important aspects to his presence – it creates an opportunity to make friends with each performer taking part in his plays, and to really touch all our hearts. Nassim is on until 27 August 2017 at the Traverse Theatre. Click here for more details.